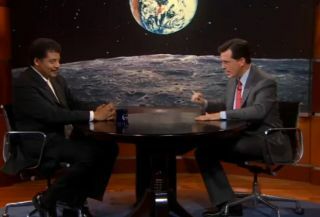 Comedy Central talk show host Stephen Colbert and astrophysicist Neil deGrasse Tyson discuss the impact of the end of NASA's manned spaceflight program on American scientific morale. The glory of star-trekking robotic Roombas and Iranian space turtles also get shout-outs. Thecontroversy over canning NASA's Constellation program to send astronauts backto the moon in 2020 for investment in future robotic exploration came to TheColbert Report on Comedy Central last night. Ina funny, yet substantive interview, comedian host StephenColbert and frequent guest Neil deGrasse Tyson lamented NASA hitching rideson Russian rockets to the International Space Station after the space shuttleretires this September. The spirited conversation also delved into theinspirational value of manned spaceflight over the launching of probes.? "Youknow I am a huge fan of space exploration," Colbert told his audience. "No one wants to grow up and hear a robot landed and say 'This is onesmall step for bleep-blorp.'" Tyson,an astrophysicist and director of New York City's Hayden Planetarium, agreedwith his interviewer in saying that "the manned program is a force ofnature on the educational pipeline of America. It is the force that excitespeople to want to become scientists in the first place." Colbertcalled astronauts "the supermodels of science" and said that withoutthem leading the charge, the United States might lose its edge over othernations such as Russia in space, as well as some well-earned scientificprestige. Colbert'sshow played a clip of Rep. Pete Olson (R-Texas) protesting the Obamaadministration's plan to scrap manned spaceflight on the United States House ofRepresentatives' floor on March 10. "If we stay the path the president'sbudget lays out," Olson said, "the United States faces the very realand very humiliating prospect of paying billions of dollars to Russia for yearsto hitch rides to the International Space Station that's been largely built byAmerican taxpayer funds." Colbertplayed in another clip, this time from a March 20 speech by Rep. Ted Poe(R-Texas), "Now even the Iranians have entered the space race . . . [inFebruary], they sent a rat, twoturtles and a worm into space." "Here'swhat will be missing without the manned program," said Tyson about theslashing of United States' government funding for the astronaut corps. "When you're a kid in school, who are your heroes?" "NotIranian space turtles," Colbert replied. Tysonsaid when he asks his colleagues who are champions of science in space and whatit was that got them interested in space, they have responded "theastronauts." Colbertand Tyson worried about the impact that the planned shifting of funds withinNASA from human spaceflight to robotic missions will have on the future ofAmerican scientific morale. "Worstof all, guess what NASA plans to spend its budget on now that Obama has killedthe Constellation program?" the comedic anchor asked. "$4.9 billionto develop better robots, and $3 billion for unmanned ships." "Sendingrobots into space does not win glory for Americans," Colbert went on. "It wins glory for Roombas." "Youalways want to invest in robots," Tyson said. "The problem is youdon't want to do that to the exclusion of the rest of the manned program . . .People don't name high schools after robots." ThoughNASA does intend to support commercial,private efforts to get people into space, Colbert and Tyson feel that theend of the astronaut era bodes badly for space science in general. Colbertsaid that "Once upon a time, astronauts were America's heroes. Now weeliminate them in the third round of Dancing with the Stars," inreference to BuzzAldrin, the second man to set foot on the moon, recently getting booted offof ABC's primetime dancing contest. "Buzz Aldrin is the only one of thoseclowns who's even been to the stars," said Colbert.? Abig reason for keeping manned spaceflight going strong — whether through theover-budget, flawed Constellation program or not — is to prepare mankind forthe next frontiers in space, such as Mars, asteroids and beyond, according toTyson.? "It'sbeen 27 years since we've been farther away from Earth than a couple hundredmiles up," said Tyson, referring to the so-called low-Earth orbit wherethe International Space Station circles. "Thenext time we leave low-Earth orbit I don't want it to be a three year journey[to Mars] not remembering how to do it," said Tyson. "So, yeah, yougo to the moon. Next asteroid comes, visit the asteroid. Comet comes, checkthat out." 'Ifyou only go into low-Earth orbit, this is boldly going where hundreds have gonebefore," Tyson said. "That's not advancing the space frontier."